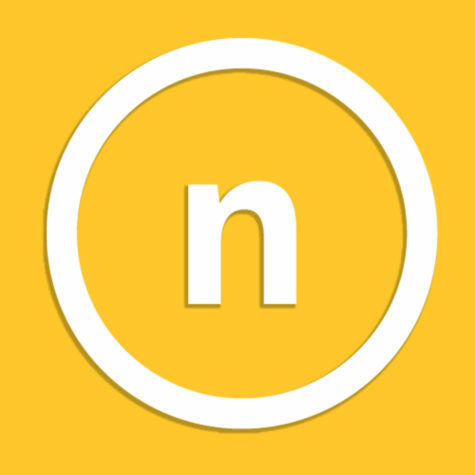 NKU attendance improved in every major category, including student attendance. A rise in success by the NKU men’s basketball team has led to an increase in fan participation in BB&T Arena. 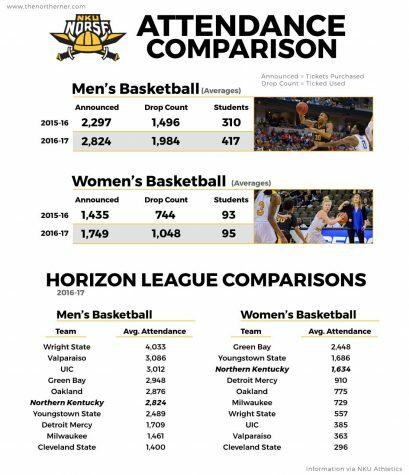 Average attendance at men’s basketball games has risen considerably this season, thanks to a 24-11 season by the Norse. Average announced attendance at a men’s basketball game this season was 2,824 people, a 22.94 percent increase from the season before. Brandon Hays, who is in just his second year at NKU as the assistant athletic director for marketing, promotions and tickets, says you can look at any NKU men’s basketball attendance numbers and attribute it to the team’s success this season. “Even early in the season when we didn’t know what this team was really made of, we saw some pretty big increases,” Hays said. Single game tickets also rose significantly this season. “In February, the amount of tickets we were selling at the door showed you that it was first time fans that wanted to walk in and check it out,” Hays said. Women’s basketball attendance also rose, despite not having the success this season the men enjoyed. Average announced attendance for women’s games was 1,749, which was a 21 percent increase from the previous season. That number was inflated partially by the Victors Hoops for Health day in late November, which brought over 5,000 students from area schools to BB&T Arena. Overall, men’s and women’s basketball combined to bring in $168,742 in revenue for the athletic department, which is a 25 percent increase from the previous season. Season ticket sales and individual ticket sales both increased as well. Hays and his team focus on a lot of their attention on group sales, which shows in the attendance numbers. NKU made $21,967 from group tickets sales which is nearly an 85 percent increase from the previous year. A lot of the group sales are made by different youth sports groups such as basketball teams, dance teams and jump roping teams. Hays tries to give these young fans an experience they can’t get at other area universities such as high fiving the players coming out of the tunnel, having them perform at halftime and providing autograph sessions after certain games. Hays says they will host another Victors Hoops for Health day during a women’s basketball game next season and hopes to make it an annual event. Last year in February, the Norse played Valparaiso in the final game of the season. Hays recalls no students were in attendance for that game. This season in the same situation, the student section was packed to watch the Norse beat the Crusaders, who were leading the Horizon League prior to the game. Student attendance at men’s basketball games jumped overall this season, with an average of 417 students attending games, a 34 percent increase from the 2015-16 season. Hays says the department applied their philosophy to see non-student tickets to attract students by targeting groups of students who were heavily involved on campus and partner with those groups to develop them as fans. Hayes set up different events for those groups, including competitions between housing floors and setting up a system for Greek organizations to earn points. Hays also helped set up the orientation leader reveal as well as the homecoming tailgate. With that core group of students in place, Hays has more confidence to spend budget money on the students. Men’s basketball coach John Brannen provides a face for the marketing department to rally behind. During game, Brannen will often motion to the crowd in BB&T Arena to get loud during key moments of many games. He and his players often comment on the energy of the crowd during most post game press conferences and thanked their supporters every chance they could during their Horizon League championship run. Hays and Brannen talk before every home game about what the marketing team is planning for that game and discuss what worked and didn’t work after almost every one of those home games. “He really helps us,” Hays said. “He’s all about the game experience. I was joking with one of our older fans that our music is too loud, people are yelling over the loudspeaker. Our cheerleaders are running laps around the floor throwing stuff at people. Victor is running around on someone’s shoulders. Brannen noticed during the season that people didn’t stand up after Cole Murray hit a three point shot, so Hays had the cheerleaders throw little basketballs into the stands after Murray hit a three, causing people to stand up. More importantly, Brannen turned the Norse into an NCAA Tournament team after only winning nine games the year before. 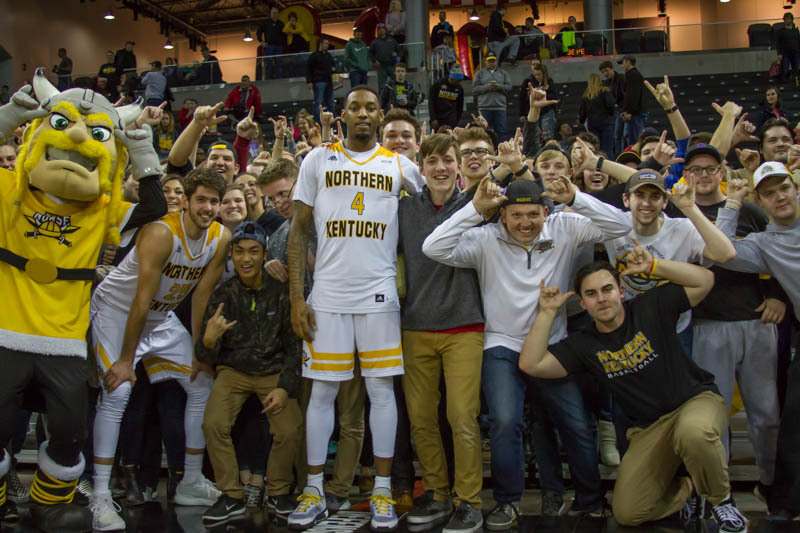 With the majority of the roster heading into their junior and sophomore years, more winning appears to be in the future of NKU. “Winning matters more than anything I do,” Hays said. Hays also meets with women’s coach Camryn Whitaker once a week to discuss what they can do to help her program. “Both of our coaches are great about giving a damn about what we are doing over here,” Hays said. Hays says season ticket holders are using their tickets more often than they have in the past. During the men’s 2016-17 season, the percentage of tickets that went unused was 32.8 percent, which was a two percent decrease from the year before. The percentage of unused women’s tickets has also gone down from 50 percent to 45 percent. Hays believes the familiarity with the Horizon League is helping fan interest. The marketing team helps with that familiarity, sending information about each opponent to season ticket holders. NKU basketball season tickets for the 2017-18 season went on sale March 22. 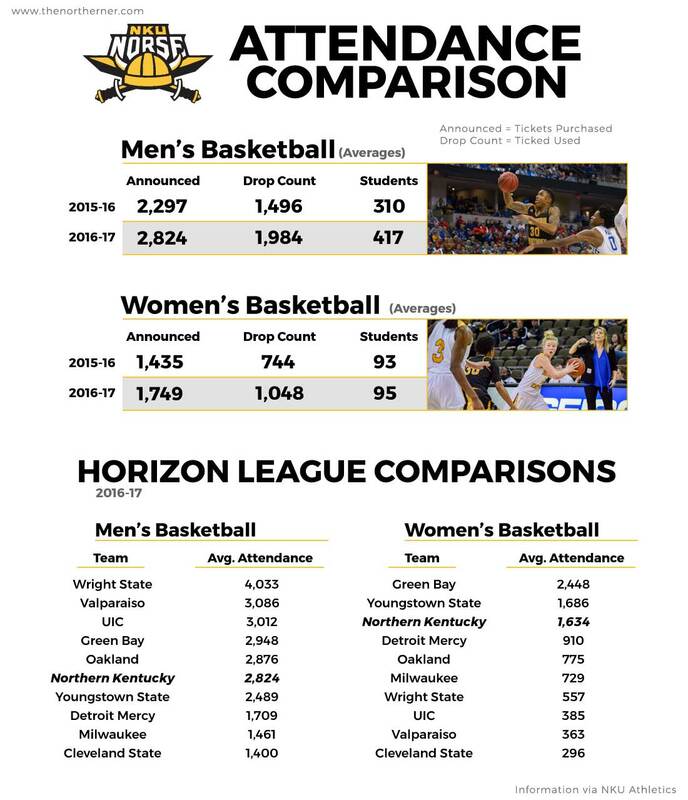 Prior to the start of the Horizon League tournament, Hays said he was contacted by several new fans who were interested in buying season tickets. Right now NKU has around 700 season ticket holders, according to Hays, but he wants to get that number to about 1,000 season ticket holders next season.